My review of Pinball Deluxe. 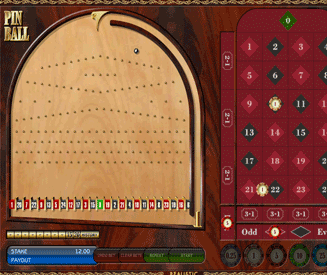 Pinball Deluxe is a game of roulette that uses a vintage pinball machine instead of a wheel to select the numbers. Shoving a pinball machine in to a roulette game is a daring stunt, but it works surprisingly well. I wouldn’t say it’s on par with the revelation of putting peanut butter and jelly (jam to all us non-US persons) together in the same sandwich for the first time, but it’s not too far off. However, Pinball Deluxe for real money isn’t the only game in its field. It has a very strong rival in Pinball Roulette. Find out which of these two pinball roulette tables is the most fun to play in the "fun rating" section below. Pinball Deluxe fun score - 70%. Pinball + Roulette = Fun. We’ve already established that in my review of Pinball Roulette. So on its own merit, real money "Pinball Deluxe" is a very enjoyable game to play. However, seeing as both as these games are a variation on the exact same idea, it would be an absolute crime not to compare them head-to-head. So who wins in this battle of the ball-bearings? Pinball Deluxe uses a vintage pinball machine (think pinball minus electricity). Pinball Roulette on the other hand uses a more modern machine setup with bumpers, plus it has a thrilling bonus round that allows you to multiply your winnings in a secondary pinball machine. I will concede that Pinball Deluxe has slightly better ball physics and gives the impression of a more well-crafted game, but if we’re just comparing the two in terms of fun, Pinball Roulette has the edge. Note: For a hi lo game that plays just like Pinball Deluxe, try Arcade Hi Lo. A simple overview of the rules. Bet on numbers, colours, sections and all that other stuff you can do in roulette. Fire the ball in to the pinball machine and hope that it falls in to one of the buckets/numbers you have wagered on. There are a few slight differences between standard roulette and Pinball Deluxe roulette, but if you just imagine using a pinball machine instead of a wheel you won’t be too far off. I’m not going to bore you with the basics of how to play roulette, so I’m just going to get down and dirty with the Pinball Deluxe pinball machine and the unique betting options available. Pinball Deluxe uses an old-school pinball machine that I’m sure grandparents the world over would love. No bumpers, no flippers, no electricity. Just pins and a ball bearing. It’s a bit like Pachinko. After placing your bets, the ball is automatically fired up to the top of the machine. This is where the laws of gravity take over and you get to witness some beautiful game-physics as the ball bearing bobbles around and across the pins in the centre of the machine. The ball will eventually fall in to one of the 25 buckets at the bottom. The numbers alternate between black and red, with the green 0 in the centre of the row. Fact: Although you wouldn’t think it, the ball is equally likely to fall in any of the 25 buckets. The ball has the same odds of falling in to an outer bucket as it has of falling in to an inner one. Who'd have thunk it? 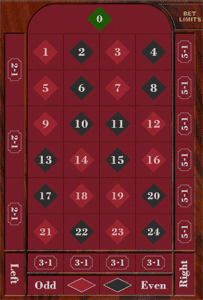 Pinball Deluxe uses 25 numbers instead of the conventional 37 numbers found in normal casino roulette. Therefore, the odds and payouts for column and row bets are slightly different thanks to the 4x6 layout as opposed to the standard 3x12 layout. Aside from all the standard colours and numbers wagers in Pinball Deluxe, it also offers the wagering option of "Left" or "Right". 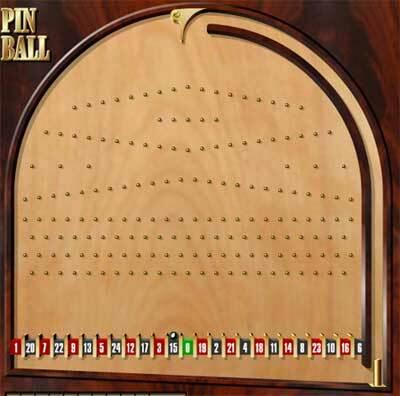 This wager allows you to bet on which side of the pinball machine you think the ball will land. The left and right sections are divided by the central 0 number. The payouts are 2x, which is the same as other even-money bets like red or black and even or odd.